Social media has become the preferred channel for customers to source information about and connect with brands. Marketers are, therefore, increasingly employing influencer marketing to achieve their goals. The first step towards this involves choosing the right influencer marketing platform. Ideally, the platform should establish a direct connection between the influencers listed on it and brands. These platforms also help influencers reach out to potential customers while enhancing engagement with existing ones, as well as monetize their social media channels. Mentioned ahead are a few platforms worth considering if you’re contemplating leveraging influencer marketing for your brand. Upfluence provides access to over 1.2 million influencers across a wide range of industries. Marketers can perform searches based on the size of an influencer’s social communities, location, and engagement rate, among other factors. You can also view the influencer’s latest posts, gauge their performance, and connect with them through this platform. Marketers can implement email campaigns via influencers with the help of an in-built emailing tool, which enables them to send mass messages. The platform offers two products that can be used either independently or together. a. Reachr: This is meant for brands that want to find influencers to create content for them. b. Publishr: This is for brands who want to dabble in the advertising world. Upfluence typically caters to marketing, advertising and PR agencies, as well as freelancers. With an influencer base of over 150,000, AspireIQ enables brands to build a partnership with content creators. It is a self-service platform that helps brands assess listed influencers based on their content, audience demographic, and traffic history. AspireIQ offers an easy-to-use interface, an all-inclusive database, and an AI-powered algorithm that helps brands match with the most relevant influencers in their industry. The platform also supports actual content creation with its Creator Collaboration Toolkit that streamlines the process of collaborating with influencers, engaging audiences, and monitoring performance. AspireIQ is perfect for small-and-medium-sized agencies and brands that create their own in-house marketing campaigns. Pricing: 10% fee to brands on top of what they pay to creators. 10% fee to creators, deducted from their earnings. FameBit is a self-service platform that allows brands to launch campaigns at zero cost, while empowering them to track key metrics from one place. Companies or agencies can set up profiles and post “sponsorship opportunities” for content creators. Influencers (or “Creators” as FameBit calls them) can also search through listings and reach out to brands with proposals to help them tell their brand’s story. Marketers can view influencers’ information such as social media following and audience demographics. Companies looking to tap a younger target audience base are likely to find FameBit helpful when zeroing in on a suitable influencer. HYPR provides brands with access to over ten million influencer profiles and their contact information. It has dedicated account managers to help marketers find effective influencers by offering real-time social analytics data. This, in turn, allows brands to check out the influencer’s location, audience demographic and psychographic data, and more. This platform considers itself “talent agnostic,” as its search engine considers factual data rather than opinions to determine who qualifies as an effective influencer. The search engine examines each influencer’s social media posts to collect data and determine their popularity. HYPR caters to small as well as big brands as it allows comprehensive and targeted searches for specific types of influencers. Established in 2011 and still growing, NeoReach boasts of an influencer base of over three million across major social media platforms. It aims to serve as a self-service influencer marketing software as well as offers an option for “Managed Campaigns,” wherein it executes full-fledged campaigns for clients. NeoReach offers user-generated content campaigns and real-time reports with the ability to export them. Users can employ forty filters when searching for influencers across several criteria, including existing brand affinities, social media performance, and audience demographics. It is also equipped with a comprehensive dashboard that enables marketers to monitor deadlines and review posts. Even though it is still growing, NeoReach has been catering to big brands and is fully capable of executing large-scale influencer marketing campaigns. Popular Chips provides marketers with the complete demographic details of the followers of any influencer and celebrity in the world. It also generates reports that help enhance your marketing KPIs, improve your ability to learn from competitors, and figure out who is tagging you in their posts, among other things. This platform employs its proprietary influencer search engine and analytics platforms to help you get an accurate understanding of the latest on social media and plan your influencer marketing strategy accordingly. Its AI-driven solutions enable marketers to gauge an influencer’s effectiveness on social media, rank, engagement rate, and more. Other helpful features include audience demographics, competitor benchmarking, performance analysis, content and video analysis, social listening, and fake follower identification. Brands looking to increase their awareness and get people excited about its offerings will find Popular Chips helpful. 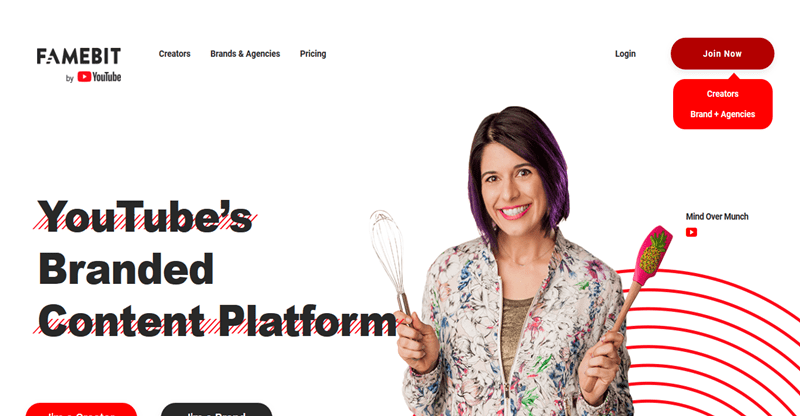 Scrunch is a robust influencer marketing platform that aims to organically connect brands and marketers with bloggers and social media influencers. Established in 2015, Scrunch boasts of an influencer base of over 20 million. Marketers can monitor their campaign on a user-friendly dashboard and view the top-performing influencers, their reach and engagement rate, posting frequency, social following, and traffic history. The platform uses data-driven analytics to help marketers determine if their bloggers are actively driving ROI for their business. It is also equipped with a sophisticated search engine with several filters. Conducting search is easy, but interpreting the results may not be so as the interface becomes congested. However, users can customize this to display only the columns they want to see. Scrunch is highly appealing to small businesses that can take advantage of its “freemium” pricing model. In short, Mavrck turns its best existing customers into influencers, who then highlight the brand’s features and benefits. Brands can either create a separate white-label microsite or use a special plugin for their existing site, and encourage their customers to log into their site with their Facebook credentials. Mavrck then collates the data needed to determine the customer’s reach and engagement level, and ultimately discern the extent of their influence. This information, in turn, helps Mavrck decide whether or not the customers can be used in an influencer campaign. Mavrck has identified over ten million micro-influencers in this way. One may say that Mavrck’s influencers wouldn’t probably even know of their influence. However, Mavrck considers them as participants of a sophisticated loyalty program, where they get rewarded for sharing content. Traackr enables marketers to see how the audience responds to an influencer’s content so they can identify the best content creators and connect with them, taking the guesswork out of the process. Apart from a large influencer network, this platform offers a deep analytics engine and real-time data related to the influencer’s effect. With a clear focus on Influencer Relationship Management, Traackr aims to build lasting relationships with its influencers. This allows brands to reap the benefits progressively over time. It facilitates social listening of its influencers, which helps brands and audiences engage with them in meaningful ways that engender trust among all the parties involved. Traackr is meant for brands that are looking to make influencer marketing a part of their long-term digital marketing strategy. It is capable of managing large-scale campaigns for global audiences. Markerly is an end-to-end influencer marketing platform that establishes honest brand affiliations and connects marketers to over two million influencers via social media and blogging platforms. This self-service platform offers CRM tools that are designed to organize your workflow as you create a network of influencers for collaboration. This platform also enables influencers to collaborate with Fortune 500 companies. Based on their posting history, it matches influencers with brands they like or introduces them to those that offer products/services that fit their interests and style. Markerly’s real-time dashboard collects information pertaining to influencers’ engagement rate, conversions, reach, earned media mentions, and so on to help them build their own branded community. There you have it, the 10 most effective influencer marketing platforms the digital world has to offer. Each of them provides marketers with an expedient way to identify and collaborate with influencers that have a strong hold over their particular niche. You’re sure to find a platform that suits your influencer marketing goals from among these.